Four goats have been found brutally slaughtered in a rural village - sparking fears of killings linked to a 'satanic ritual'. The animals were discovered dead within a few days of each other in the village of Tipton St John, Devon. Each goat was found either with their head twisted backwards or with their throat cut. Jimmy Small, 66, who owns a small holding in the village and lost two of his goats to the killer, said: 'The whole village is up in arms over what is happening. 'Everyone is talking about it and locals are keeping their eyes open. 'I recognise it could have something to do with the occult. 'One of my goats was left dead foaming at the mouth with a swollen belly. 'The other I found dying and crying with its head twisted backwards. 'This has horrified locals. What sort of people could do this? 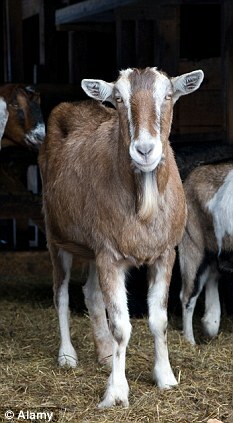 Another goat owner, who wished to remain anonymous, said: 'I found two of my goats dead within 48 hours of each other. When I told my vet he advised me to read a book on occult. He seems to think the way the goats were killed and because they were horned, it may have something to do with satanic ritual. 'When I saw the first goat I thought it was a bizarre accident. 'The next involved the mother goat. We found her the day after Easter Monday with her throat cut from ear to ear. 'It had been dragged to the same spot where the other goat was found.